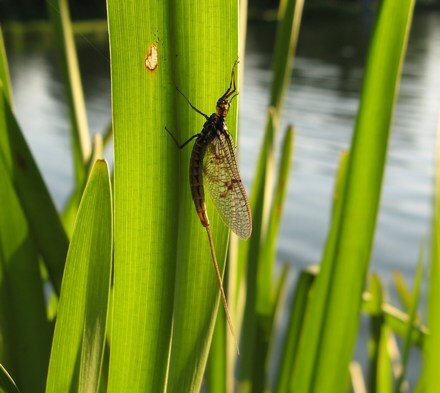 Two main criteria must be met in order for mayflies to develop through their entire life cycle, a body of water for reproduction and vegetation to feed on. 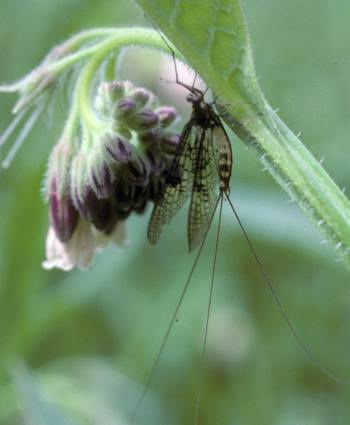 This means that any environment that satisfies these two conditions is a potential habitat for mayflies. Rivers and lakes in particular are popular habitats. This means that mayflies can be found all over the world! Some species exhibit habitat preference when it comes to the type of sediment at the bottom of the river or lake due to specifications of egg and nymph development. Psammophilous mayflies for example prefer river beds comprised of compact substratum, which in situations with slow current also has a layer of silt on top (Orwin, 2009). Silty-sand river bottoms are colonized more by the Procloeon nana nymphs, and Cercobrachys minutes nymphs are typically found on either silty-sandy bottoms or on compact, shifting sand (Orwin, 2009). These different niches are formed due to preference of the river bottom. Some species prefer to live on substrata or wood fragments that are displaced by the water current, and other species prefer to live on compact substrata or plants which would lead to less drifting. 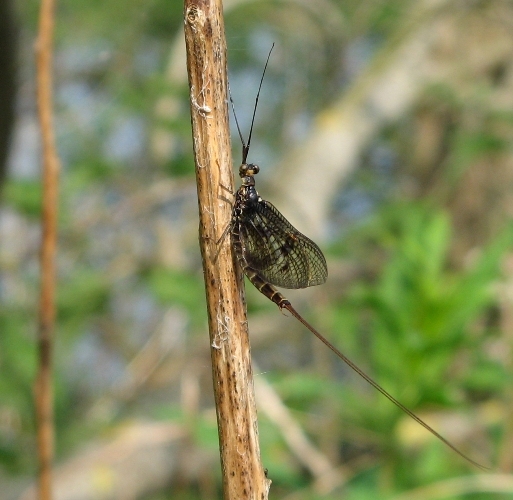 The mayflies are not the only ones to occupy river and lake bottoms, besides mayflies numerous oligochaetes, chrinomids, and bivalves can be found there as well (Orwin, 2009). Once the ma yflies molt passed the nymph stage and enter the subimago and imago stages, they take to the air and shelters nearby to complete their development and lay eggs. These changes in scenery throughout their life cycles leads to interactions with a multitude of different organisms as well has foster unique developments between species. Several species of mayfly have developed adaptations that help them along with development based on their specific habitats. To learn more about these specific adaptations visit the adaptations page. To view organisms that share these similar types of habitats visit the damselfly page on multiple organisms.net.